Our stay at Kokuya Hotel is likely the highlight of our 2018 trip to Japan. This ryokan (or hot spring hotel) is similar to a small inn that runs more like a bed and breakfast. With only 20 rooms, the staff really focuses their efforts to making our stay enjoyable. Everything from check-in to check-out felt very family oriented, and not like a major hotel. In fact, you literally leave your shoes at the front door and switch to slippers for around the hotel. In that same way, this hotel is not focused on western style of living but instead a Japanese futon on tatami mats. The beds are stored away until the evening when the staff sets the room up for sleeping. The food (separate charge) was very traditional as well. Dinner is served as approximately 10 small dishes of very tasty dishes. For breakfast, you have the option of western or Japanese breakfast. The service for both are in their dining room, where the tables are privately situated. We were visiting late October, which I assume is off-season because the train ride up was near empty. There is no snow and 50/50 chance of seeing snow monkeys at Jigokudani Monkey Park. Hotel guests are offered a free shuttle to Jigokudani Monkey Park, but must find your own way back (either taxi, bus, or walk). How to get to Kokuya Hotel? For those considering staying at Kokuya Hotel, despite being a small town, note that transportation was not a problem. You will need to contact the hotel a day before you arrive to arrange a shuttle pickup. Depending on where in Japan you are coming from, you’ll want to get to Nagano Station (if you have a JR pass, you can book a reserved seat on a bullet train). Once at Nagano Station, transfer to the Nagano Dentetsu-Nagano Line. This line is privately operated by Nagano Electric Railway. It does not accept PASMO or Suica cards. You’ll need to purchase a separate physical ticket ($10 per person). Take this line all the way to the end, Yudanaka Station. From here, you can use the hotel shuttle pickup. If you didn’t make previous arrangements, you can also take a taxi (8 min) or walk (30 minutes). Though it wasn't stated anywhere on the website, they sent us an email (and others on forums have confirmed) that if you inform Kokuya Hotel of your arrival time a day before, they can arrange a pickup. The major draw to this hotel are the rooms with a private onsen, perfect for the traveler just not ready to get naked in public. Note that having a private onsen makes the cost more expensive, but the experience was worth it for us. The in-room onsen is spacious and was one of several major reasons why this “resort” experience ended up being the highlight of the trip. The outdoor shower is right next to the private onsen, used to scrub yourself clean. The entire setup was located in an enclosed outdoor patio, exposed to the chilly outdoor air, but shielded in privacy. This also meant that we didn't have a view. Some rooms have private onsens with views, but not our particular room. But having the ability to soak in a hot spring anytime during our stay was worth it. 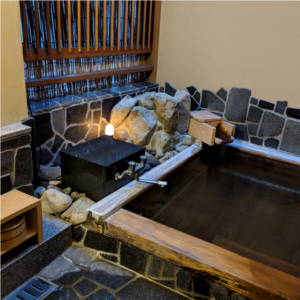 In fact, I decided to take 30 minute soaks on several different occasions, and so having a private onsen connected to the room was very convenient. Other reasons people opt for Private Onsens are you can enjoy it with your significant other, where public onsens are split by gender. Also, displaying tattoos in public onsens is subtly frowned upon. Some onsens may even reject those with tattoos. Public/Private Onsen inside Kokuya Hotel? If your room doesn’t have a private onsen, the hotel has several other onsens that alternate between for men or for women. They also have some onsens that are private for guests on a first come first serve basis. For our one night stay, I didn’t use their other onsens, but we got the entire tour upon arrival. The six public shared onsen's only for Kokuya Hotel guests are split by genders, and the various onsens change genders throughout the day. Just look for the colored flags outside the room. Each onsen have their open/close hours, all of which are printed in the hotel room. Additionally, there are two private onsen's for Kokuya Hotel guests. These are not split by gender, but instead have a lock where you can enjoy a private experience with the onsen (not in the hotel room, but on the hotel property). Due to the small number of rooms at the Kokuya Hotel, their staff spent a lot of time getting us accustomed to their hotel. There were many trainee employees, which may be due to the fact we visited during the off-season. Right from when we entered the hotel, we immediately left our shoes at the front desk and the rest of our stay inside the hotel was with hotel provided slippers. If you're comfortable, you can even wander around inside/outside the hotel in the provided Ryokan (printed instructions on correct way to wear it is in each room). Our stay included dinner and breakfast, which was not on convenient, but also very good. It's several courses of small dishes. This equates to a lot of service (and oddly no tipping). The food was unique, not too salty, and a covered all varieties of food from soups to veggies to meats. Even though Japan has amazing customer service in general, the level of service we received at Kokuya was even a notch above. It made for a great relaxing one-night stay in Nagano. Public Onsens within walking distance in the Village? There are 9 other public onsens that people from the entire village can use. These onsens do have hours and the there is a separate hotel key. It's something for the adventurer to experience, but note that there are plenty of onsens to try at the Kokuya Hotel.